Motivated seller, all reasonable offers considered! Perfect for big group reunions in mountains! Floating week! Inquire for details! 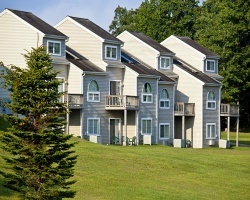 *Tree Tops at Pocono Mountain Villas* is a four seasons resort retreat in the beautiful Pocono Mountains of Pennsylvania that provides a picturesque backdrop for your vacation memories. Relax and enjoy the mountain serenity and close proximity to area attractions including skiing, tubing, hiking, boating - you name the adventure, i s likely close by. And with a variety of accommodations from which to choose, year-round on-site amenities, and restaurant, Tree Tops at Pocono Mountain Villas will likely fast become your favorite family Pocono Mountain resort destination. To discover more, please visit www.exploriaresorts.com. *RCI & Interval International Affiliated Resort* This Property is now Managed by Exploria - Featuring a finely appointed 3 bedroom, 3 bath lockout suite that will accommodate 10 guests comfortably. Usage is annual in a floating, winter season week. Motivated seller, price is negotiable! Buyer may receive a title fee credit, inquire for details! For more information or to make an offer, please submit the inquiry form.